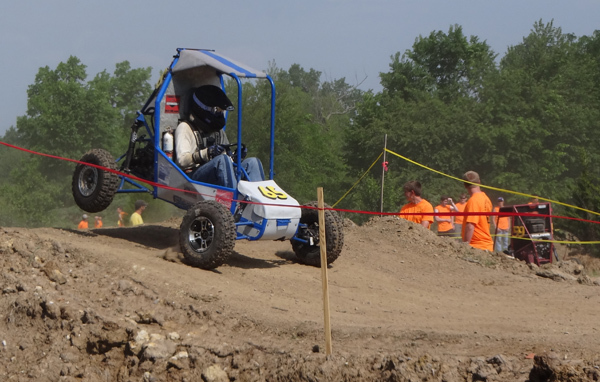 The University of Rochester's Baja SAE team arrived at Pittsburg, Kansas, this spring much better prepared to compete against more than 100 other universities than it had been a year ago at a similar event. The all-terrain vehicle the team designed and built sailed through the initial technical inspection, which is highly unusual when a team is entering its first (and in this case only) competition of the year. The team finished a very respectable 11th in maneuverability. Nonetheless, it finished 43rd in the overall standings at the Baja SAE-Kansas event – which means there is still plenty of room for improvement. "We're still finishing in the solid middle of the pack," noted William Green '16 of Mechanical Engineering, one of the team's leaders. "It's not a matter of keeping up the good work but keeping pace with all the other teams that are getting better each year." 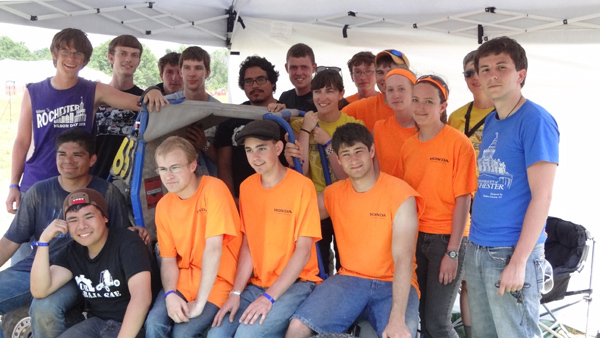 A top priority this year was to have the vehicle fully assembled well in advance of the actual competition. The team pulled it off. "We had two to three solid weeks of testing," said Berto Perez '15 of Mechanical Engineering, another of the team's leaders. "We were able to fix things that would have been a problem otherwise." Last spring, team members were completing the vehicle's assembly right up until the moment the team left for a competition in Tennessee. "It was a much more pleasant experience this year," noted the team's faculty adviser, Sheryl Gracewski, Professor of Mechanical Engineering, who accompanied 18 team members to Kansas. "The team was more organized and more prepared. They worked really well together." The four-day competition ended with an endurance run. Five laps in, the UR vehicle rolled over, damaging the upper arm of the front suspension. Lack of a spare part meant the team lost about two hours before the vehicle could get back on the track. Team members agreed it will be important to have spare parts on hand next year. "Most of the top 10 teams have spares for just about everything," noted Leslie Johnson '16 of Mechanical Engineering, who graduated this spring, but plans to be an alumni adviser for the team next year. Of the 18 students who made the trip, 16 will likely be back next year – plus other members who did not make the trip. That will provide a solid nucleus for the team to build on. If possible, team members said, they would like to compete again this fall at an unofficial "Midnight Mayhem" competition. Team President Nick Brown '15 of Optical Engineering said the team is usually able to recruit plenty of freshmen at the annual start-of-the-school-year Hajim School E-social and University Activity Fair. The challenge is retention. The Midnight Mayhem helps by giving freshmen a good introduction to Baja competition.